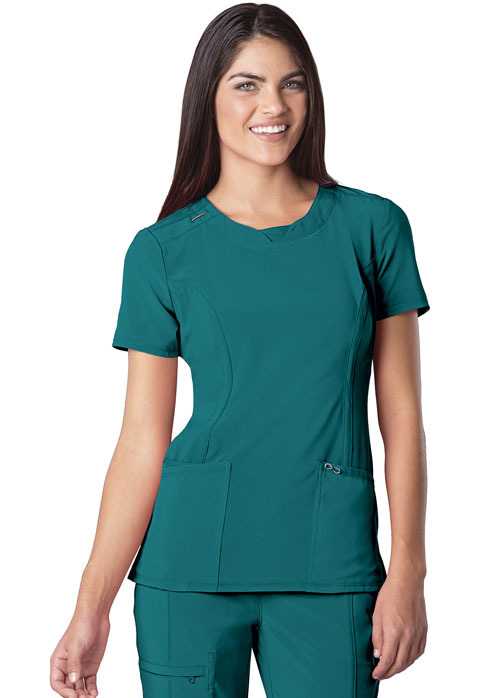 A Contemporary fit round neck top with a rib knit inset at the front neckband also featured are shoulder yokes, a bungee I.D. badge loop on the right shoulder, front and back princess seams, two patch pockets, one interior pocket, and side vents. Stretch rib knit at the center back panel gives this top its slimming shape and allows for extra movement and comfort. Coverstitch detail throughout. Center back length: 26".